Insights from quantum information theory show that correlation measures based on quantum entropy are fundamental tools that reveal the entanglement structure of multipartite states. In that spirit, Groisman, Popescu, and Winter [Phys. Rev. 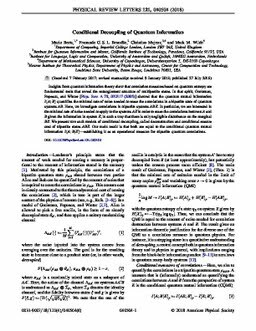 A 72, 032317 (2005)] showed that the quantum mutual information I(A;B) quantifies the minimal rate of noise needed to erase the correlations in a bipartite state of quantum systems AB. Here, we investigate correlations in tripartite systems ABE. In particular, we are interested in the minimal rate of noise needed to apply to the systems AE in order to erase the correlations between A and B given the information in system E, in such a way that there is only negligible disturbance on the marginal BE. We present two such models of conditional decoupling, called deconstruction and conditional erasure cost of tripartite states ABE. Our main result is that both are equal to the conditional quantum mutual information I(A;B|E)—establishing it as an operational measure for tripartite quantum correlations.